Hi beautiful ladies! I hope you’re all doing great. 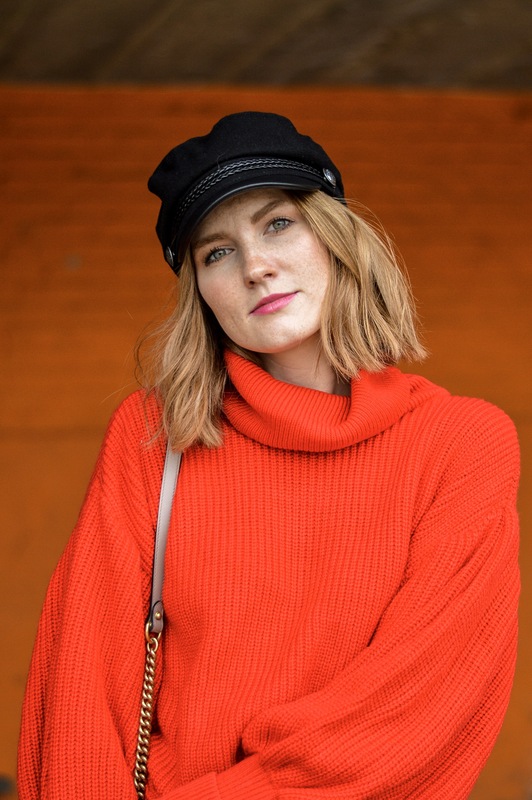 I’m back with a new outfit post, which was highly demanded. I guess I need to take my camera more often so I can have more posts like this on the blog. 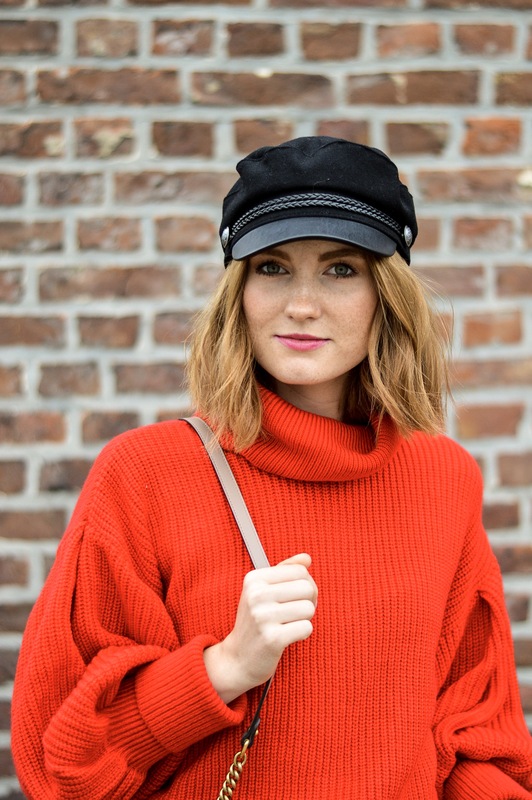 This look brings some color in these grey Belgian pre fall days. I found this red over sized sweater in Topshop while I was on night stop in Manchester (red is a must have during FW 17/18). I arrived late at night but I did have an entire afternoon to get out and have a shopping afternoon. Together with my colleague, I went to Arndale Shopping which was a few blocks away from our hotel. 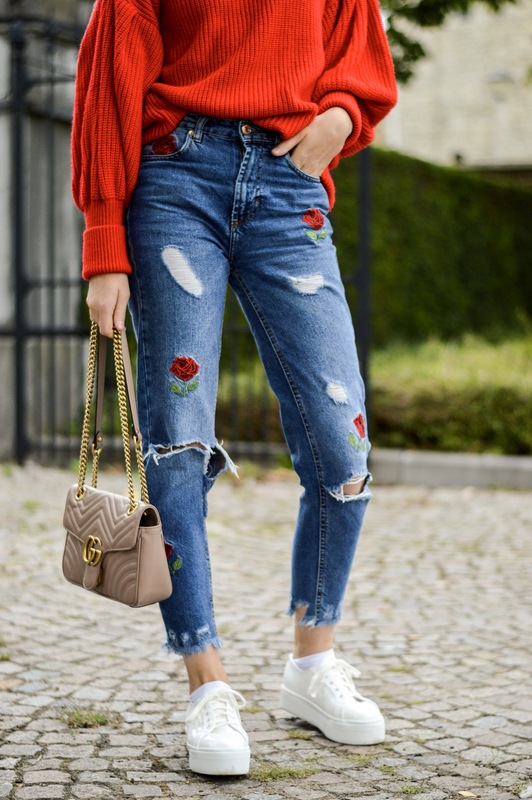 I wore a ripped jeans with embroidered roses to match the sweater. It’s one of my favorite jeans that I found at Pull and Bear last year. I love to reuse items from last season into new outfits so you can see I do not throw clothes away every time a new season starts. For shoes I am wearing my new favorite Superga sneakers. I have been looking so so long to find completely white Superga sneakers. It was so bad that I even looked while on holiday in Nice, like both times. No white Superga sneaker was in my size, not in shops and definitely not online. The hunt for that white sneaker was on. 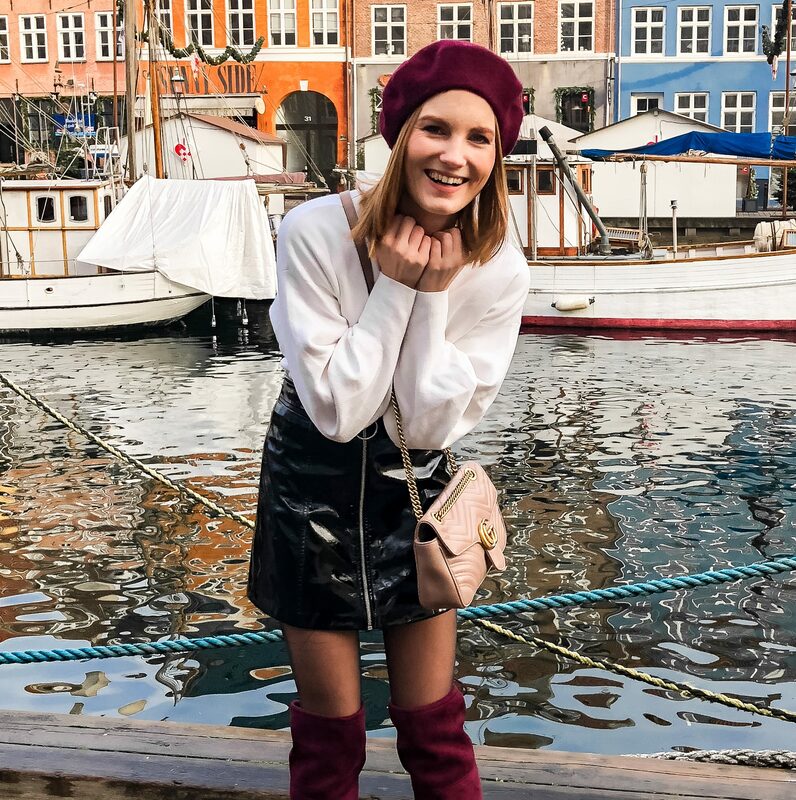 One of my favorite bloggers, Caroline Daur, had a collaboration with Superga. Together with the brand she designed her own shoes. These where the ones I wanted, like absolutely want. Just a few days ago I was scrolling through Zalando because the Bread and Butter fashion show took place. Guess what I found? Yep, completely white Superga sneakers, IN MY SIZE, from the collab with Caroline Daur. I was one happy kiddo and ordered them immediately. 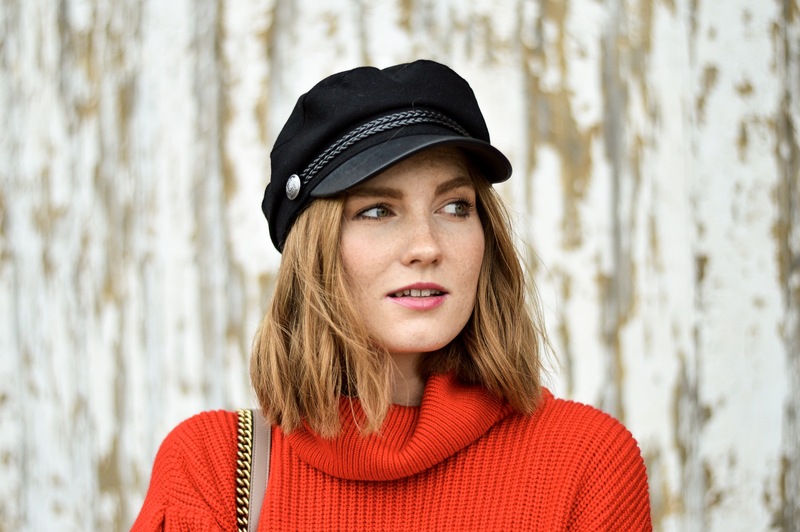 Another fashion trend this FW 17/18 is definitely the captain’s hat. Yep jumped on that wagon … I am obsessed. Like seriously obsessed. I don’t want to wear my outfits without this hat. I found this baby online on the HM app in the divided collection. My boyfriends makes fun of me, like my entire family. They like it but they think it’s weird that I’m wearing this hat. Anyway, you guys commented me like crazy! I even got the comment that I wore it best out of all the instagrammers. I feel flattered but no way in hell I’m wearing it better than Negin Mirsalehi, she is still the queen. Do I still need to say what bag I’m wearing? I went for my Gucci again. Still my best buy of the year. Expensive but SO worth it! A classic yet trendy bag that never goes out of style, that’s what all women need!